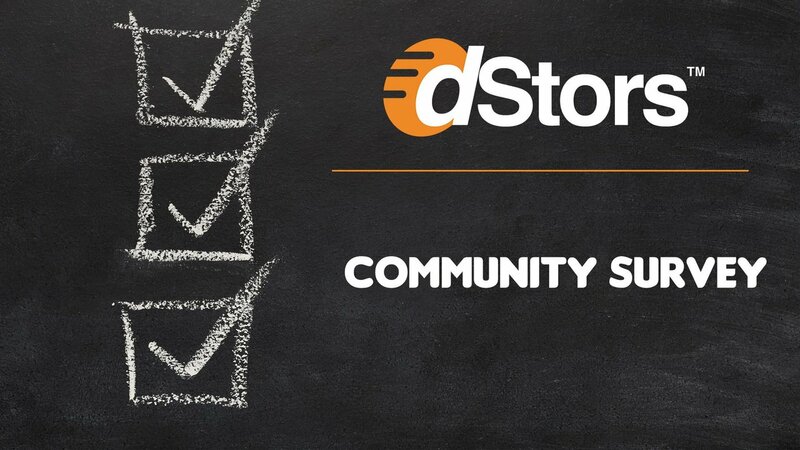 While we're working hard to deliver the newest experience for steemians with dStors - we now need your quality feedback like never before. 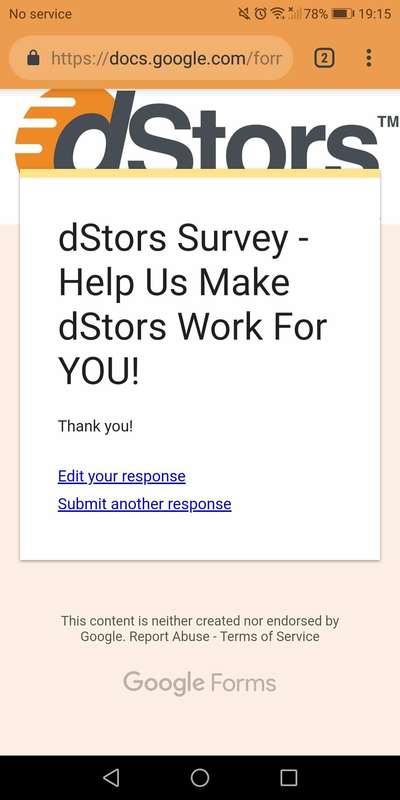 We have created a survey that will allow us to better understand your needs and integrate features to make dStors.com work for YOU! You will automatically be entered into our SteemMonsters Monster Raffle where we'll be giving out rare ALPHA packs...you never know what their value is until you open them! This is really important for all of us, so please take your time everyone and give us your most direct answers to the questions contained in the survey. Thank you! We'd like to thank all of our current supporters for believing in steem as the best blockchain to build apps on top of and for supporting the world's first dCommerce shopping channel on STEEM! It is has always been my consistent practice to preserve my privacy / identity "in here" and I, therefore, closed the form. I will not be providing that information, as it is that important to me (yes, I could take the time to make up some bogus email somewhere, but that lacks integrity ...). Thanks for your consideration, but please do not take this as any pressure. Do what you think is right. And I will do the same. You will not be successful (as I'm sure you are already well aware ...) keeping 100% of "the people" happy 100% of the time. I don't expect that. All other reasonable Steemians, whose support you need, likely won't either. I use no@thank.you a lot when this happens. It passes most parsers and rather gets the message across. Appreciate your feedback as it'll allow us to reformulate future surveys; which actually is a bit of a science. Thank you for the prompt response @dstors and your consideration of my input. While I chose not to mention it, the fact this survey was on Google only compounded my problem with responding. Not my area of expertise, but you may wish to consider alternative ways of surveying (which is great! 👍) which support those of us who wish to be more private. That's google docs and probably your privacy is not disclosed to the third party. It's always good to collect feedback from the mob before launching something. Really much hopeful for @dstors. I will be more than happy assisting you guys. Is everything on trending just ads? Not a criticism of dstors. Just riding the traffic from this post. Just done with the survey. You probably should have Auctions as well as fixed selling. I didn't do the survey because it assumes people want to sell something. I thought the premise was to monetize our shopping experience? I hope those not answering the survey also go into your data analysis. Survey monkey does an anonymous survey which might have worked better. Good point about survey monkey. Survey complete! I hope you read all of my comments. Keep up the great work @dstors! Survey complete! Congratulations on you Round A success!! Good Luck, I did not do the Survey. I have submitted my survey and have expressed my concerns. I like the way you guys are working so closely with the community, for development of this amazing platform. I just filled the survey. Thanks for asking. Hey i delegated 500 sp my question is that in 1 y from now what i receive a new token a new crypto? This is a great accomplishment. Congratulations team.dstors is gonna revolutionize the e-commerce industry. Best wishes. I would love to see an ecommerce platform built on Steem! Great initiative! Having an alternative to facebook ads/Google ads/ebay/amazon/paypal/traditional payment service providers is a MUST these days. Hope you implement fixed and auction selling, and some stablecoin pricing integration. Having some kind of fb ads/google shopping equivalent built on Steem would create an amazing symbiotic Steem ecommerce ecosystem. Completed the survey, hopefully I'll be the lucky winner. Best wishes. You got a 39.08% upvote from @booster courtesy of @dstors!